“Oh, the weather outside is frightful.” So the song goes, and so goes my life this January. The fact that Bethany House is headquartered in frozen Minnesota makes this especially relevant. (Negative 35 degree wind chill yesterday. If you ever need to feel just a little bit warmer, look up the weather in the Twin Cities and think of us!) For all I complain about the weather, though, I have to admit that I really do enjoy this season. Why? It’s simple: books. Here are just a few reasons why this is wonderful time of year for those of us whose idea of a winter sport is flipping pages by the fire. One: Hot beverages are the perfect complement to reading. This is, of course, why there are so many bookstores with coffee shops inside. (Now, when this trend spreads to libraries, I will truly be a happy person and will never again complain about how my tax dollars are being used.) I lean more toward hot chocolate myself, but I’m working on becoming a tea lover as well. Two: Chances are, you got a book or two as a Christmas present (or five, or a dozen). And if your family and friends weren’t sure which books you had already read, you might have gotten gift cards, or, as I like to call them, plastic libraries-in-the-making. The month after you put away the holiday decorations is the best time to catch up on those new reads! Three: Reading is the perfect stay-inside activity. If you live in a warm climate, you may not appreciate this as much, but there are few feelings in the world as wonderful as curling up in a warm blanket and reading a book. There may come a day when the world thaws again and we’ll be distracted by picnics and barbeques and soccer games and summer vacations…but for now, it’s time to stay inside and get cozy with a good story. Four: Many bloggers just filled the Internet with lists of their favorite books of the year. (After all, New Year’s Day is a time for reflecting on our lives, and the books we read shape us in important ways!) It’s a great way to get some suggestions for your To Be Read pile, as well as meet some wonderful reviewers who do this sort of thing all year round. In case you needed some bonus reasons (or suggestions for how to spend those plastic libraries-in-the-making), here are the four fiction books we have releasing this month. (For more information on each one, click on the cover.) Happy reading! When the king of Persia issues a call for beautiful women, a Jewish orphan named Hadassah wins the king’s heart and a queen’s crown, then risks everything to honor her God and save her people. Charlotte loves working for her botanist father, but he has other plans for her future. Will she find a way to follow her heart and fulfill society’s expectations? The man Lenore’s father wants her to marry could never capture her heart, but she’s running out of time to find a man who can. . . . In light of Reason Four, if you’re a blogger who did a Top Books of 2014 post, feel free to share a link below to recommend your favorite novels to fellow readers! I love reflecting back on what I read during 2014, then sharing my “best of the best” . . . And three of these were published by Bethany House! Until I Found You by Victoria Bylin, Keepers of the Covenant by Lynn Austin, and Meant to Be Mine by Becky Wade. I look forward to seeing what other bloggers enjoyed most. And as for the weather, it’s very cold here in Atlanta also! I absolutely love looking at people’s book lists because that is where I get to see which books I must read! I also wrote up my list of Best Books of 2014, which includes one of my favorite books from Julie Klassen! I just read/reviewed The Secret of Pembrooke Park. It was amazing! Beyond All Dreams is next on my to-read list. 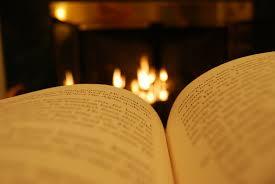 Yes, winter is definitely a time for snuggling into a warm blanket and being immersed into an exciting read! I loved reading Elizabeth Camden’s book, Beyond all Dreams! It was AWESOME! See my list of my Top 20+ reads for 2014 as well!